The game of Let'Em Ride Poker is an exciting variation of poker, except that the player plays against the house and does not compete against anyone else. Let 'Em Ride is played with a standard single deck of 52 cards. Let'Em Ride Poker begins with the player being dealt three cards face up and two cards are dealt face down in front of the dealer, these two cards are community cards that are used to complete the player's hand. The objective of Let'Em Ride Poker is simply to get any winning poker hand consisting of a pair of 10's or higher, using all five cards. Once you have placed an Ante bet, the player must decide whether or not he wants to raise the original bet (which must be the same amount as the original bet), or continue without a raise to the next round of play. Once the player has decided to either raise or continue, the dealer's first card will then be shown. The player now has another opportunity to either raise or continue. If he decides to raise, the bet will then increase by the original bet amount. Once the player raises or continues, the dealer's last card will be shown. Once the dealer's last card is shown, the player's hand is evaluated as a normal poker hand, combining both the player's three cards and the dealer's two cards. The player receives a pair of 10's or higher using all five cards shown. Luxury Casino is one of the top online casinos that offers the Let'em Ride Poker game! They are powered by the extremely popular Microgaming software and they have hundreds of great games to choose from; including slots, video poker, blackjack, and more! At the moment, all new players are eligible to receive up to $1000 in free bonus money after making an initial deposit,so head over to Luxury Casino today to take advantage of this great offer! We recommend Guts Casino to all the Let'em Ride Poker fans! Right now, all players at this exciting new online casino can get an amazing 300 pounds deposit bonus to try out all of their online casino games! As an added bonus, players are also entitled to receive 100 free spins on the Starburst game in additional free casino money bonuses! Euro Palace Casino is the place for you to be if you are looking for a top online casino to play Let Em Ride Poker. Fancy roulette tables but also high-paying slot machines and attractive jackpots is what awaits everyone when they play at this Microgaming powered casino. There are more than 300 casino games offered and all new players get a generous $500 free bonus + 100 Free Spins! Casino Action is a true "Super Star" and an online casino that offers 96.07% returns to Let Em Ride Poker players which is considered as one of the highest in the industry. Regardless if you prefer table games, slot machines, craps or video poker, you'll always have a decent chance to hit big and fill your pockets with winnings. But to get started, they are offering all the new players an amazing $1,250 free bonus as part of their welcome package! When it comes to playing Let 'Em Ride online, you'll have a hard time finding a better place to play than Slots Plus Casino. This RTG powered online casino is one of the most reputable in the business and they offer a great selection of online casino games to choose from; including one of the hottest Let Em Ride Poker games around! Register at Slots Plus Casino today and you can get up to $3,000 in free Let Em Ride bonuses when you make your first deposit! If you're looking for a new online casino to try, we highly recommend the Rival powered Vegas Crest Casino! Although they are still somewhat new, they've already done a great job of making themselves known to players from around the world; including the United States! They have all the popular casino games that you'd expect; including Let Em Ride! Visit their website today to learn how you can get up to $3,000 in free casino money when you make your first deposit at Vegas Crest Casino! Even though there are a jungle of games to choose from at Vegas Casino Online, there's one in particular that players seem to be flocking to lately. The game in question is Let Em Ride Poker, one of the most popular games available online at the moment. Let Em Ride is a fun game in itself, but it'seven more fun when you claim Vegas Casino Online's $5,000 table games bonus that can be used on Let Em Ride! Take advantage of this great offer today because we don't know how long it will last! Paddy Power Casino has hundreds of great games to choose from; including Let 'Em Ride! However, their current welcome bonus awards you with $25 free spins on their live dealer casino games! Take advantage of this great offer today and experience the thrills of playing online with live dealers! Get $25 free at Paddy Power Casino today! 7 Sultans Online Casino is pleased to announce that they are giving away up to $1,000 in free casino money to EVERY new player that is ready to make their first deposit. This bonus money can be used to play Let 'Em Ride or any other game that you'd like! Vegas Palms Online Casino is currently offering a fantastic Let 'Em Ride bonus to all new players. 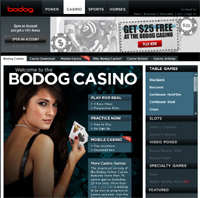 Right now, when you make a purchase of just $50, you'll get $100 in extra bonus money at this very reputable online casino! Betfred Casino is currently giving away $10 in Let 'Em Ride bonuses to every new player who makes at deposit at their Playtech powered online casino. This is one of the best Let 'Em Ride bonuses around so be sure to take advantage of it before it'stoo late! Get a $10 welcome bonus at Betfred Casino! At Slots Plus Casino, you can get up to $777 in free casino money when you take advantage of their Let 'Em Ride bonus! Your free bonus will automatically be credited to your account from the moment you make your first deposit! Get a $777 free bonus at Slots Plus Casino! Platinum Play Online Casino is currently offering the biggest and best Let 'Em Ride bonus around! All new players are entitled to $1,500 in FREE bets with no deposit required! Now you can play real money Let 'Em Ride without wagering a penny of your own money! Royal Vegas Casino is currently offering all new players up to $1,200 in free Let 'Em Ride bonuses when they begin playing for real money. There are a total of six different bonuses that you'll receive on each of your first six casino deposits. Sun Palace Casino is your source for the best Let 'Em Ride games available on the internet. They've been in business for many years and they've been paying out Let 'Em Ride jackpots since day one! Visit them today to get $10,000 in free Let 'Em Ride money when you make your first deposit. Get $10,000 free at Sun Palace Casino! When you play Let 'Em Ride at Vegas Casino Online, you'll be playing at one of the most trusted casinos around! In business for more than a decade, this popular online casino is home to some of the largest Let 'Em Ride jackpots available online! Visit them today to claim up to $3,000 in free Let 'Em Ride bonuses! Get up to $3,000 free at Vegas Casino Online! 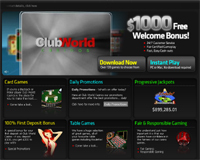 Club World Casino offers a massive $1000 welcome bonus free for new players. US based players welcome.